Welcome To Storage Depot USA Online! 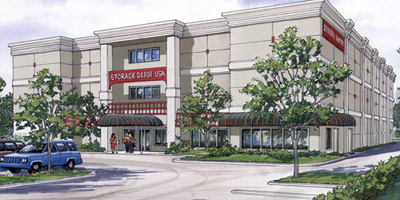 Welcome To Storage Depot USA... Year 2000 New Facility National Award First Place Winner. Your personal possessions have been in the family for a long time. So why stop caring for them now by storing them in a dungeon? Keep them pristine and protected for the same price at the brand new " State of the Art " Storage Depot USA, the " Taj Mahal" of self storage. Storage Depot USA, Melbourne's finest self storage facility. is a magnificent three story, 100% fully air conditioned and fire-sprinklered facility with clean bright colors. It is comprised of only fully enclosed interior units for your privacy and safety. Its innovative design encompasses a revolutionary computerized security system with individual unit alarms and 24 hour recorded video surveillance. The masterpiece continues with "The Best Cellar", a unique wine cellar for the storage of over 15,000 bottles of wine at just the right temperature. Storage Depot USA will further enhance your storage experience with our exceptional staff and our on-site packing and supply store to help you with all your storage and moving needs, including truck rentals, packing supplies, locks, dollies, copies, and faxes, always with friendly and professional service. For Information and Map to Location Click Here.